It's not linear. It's a relation with diminishing returns, so you can't say "2% per 500, 4% per 500" and so on. Watch Livo's video. lemon7 wrote: 1500 difference in block to accuracy is 10% chance to block? Im curious because acc manastones seem to be bad next patch because they give too little, so block may be a better alternative for shield classes, and accuracy/mr for the rest. I meant that at 1500 more block than accuracy you get the 10% rate, not that each 1500 point increase is 10% chance. Pretty sure you meant accuracy not crit. However, I don't think that's the case. These are my templar's stats with the Daeva Fighter's Ultimate set, which is the exchange gear. The difference between this set and the NPC ultimate set is that this one has fixed stats that cannot be re-rolled, while NPC one provides higher bonus stats at the cost of RNG. With a full set of block I would gain 3060 block, if we add the stance stigma to it-4560. Add it all up you get 15128 block, compare it to my own accuracy (and this a full crit templar btw on the screens) you get a piss poor 18% block chance, with moving backwards and getting bonus 500 (if it even is 500) it goes up to 21%. The armor also does not give any block in the bonus stats whatsoever. Accessories however give block in their stats. But looking at a Physical Defense set it gets interesting, with a full set of that you get 816 pdef. Lets also say Harboe adds the NPC set with max stats (he can edit it server side pretty sure as they are not fixed) you get a bonus of 238 pdef. But more importantly PvP def stacks with the pdef, so as a templar I gain bonus pdef from emp armor (350), prayer of victory (160), barricade of steel (250). Add it all up, 12391, a 1814 increase. Considering that means you take off 1814 attack from the guy, it seems like a much better, more stable and consistent choice as all weapons except the fused ones will have same amount of Physical Attack. For templar defense stats would be perfect considering sword deals only 100 less damage than a fused greatsword so you can permanently hug shield, unfortunately the meta and skills revolve around crit . In my eyes it comes down to pretty much whether or not you want to have a 20% chance to reduce damage by 70% or have a constant damage reduction on every hit someone uses on you. If I'm wrong someone can correct me. Harboe wrote: It's not linear. It's a relation with diminishing returns, so you can't say "2% per 500, 4% per 500" and so on. Watch Livo's video. Wow, that's really something. I thought those values were already poor even if it scaled linearly. Thanks I'll check it out. feetsz wrote: lemon7:"1500 difference in block to accuracy is 10% chance to block? Im curious because acc manastones seem to be bad next patch because they give too little, so block may be a better alternative for shield classes, and accuracy/mr for the rest." Yeah, then there's also the choice of just getting phys/mag attack manastones which I think is the best choice unless there is some sort of diminishing return I don't know of because of how poorly the other stats seem to scale like crit, which at 58 per stone is nowhere near as good as the flat 1.5% damage increase you get per +15 attack stone. The def stones could be good, but since there are two types you would need to cover all the bases (physical and magical) I would rather just go with attack stones since the entirety of your damage scales with a single attack stat. I think the only classes that can really scale off crit decently is sin (and dual wield glads) because their weapons have the largest crit multipliers. In kr most people tested around 35% crit chance in a full set of end game gear. 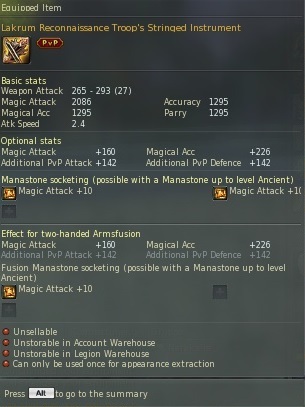 In full endgame gear you have 21 manastone slots, so if you fill all those with attack you get a full 31.5% damage increase while still keeping all the crit spell/strike you have from your gear. A 35% crit chance wouldn't even translate to 35% increase in overall average damage in large samples because most weapons have a crit multiplier between 1.5, 1.7 and 1.8 with the exception of sin and dw glads, which is why I said this will probably only be a viable stat on sin (and dw glads). This probably also makes skills/buffs with 100% crit very strong, like gladiators new berserking in 6.0. What did your tooltip read on your full crit templar at 4.7k? Im wondering if crit strike scales as badly as I think it does. PS I think shield is really good in 6.0, especially in pvp where there are a lot less auto attacks. The only big benefit to GS is the much higher auto attack dps which will make a large difference in pve. I forgot to say sword and shield templars would scale just as well as sin/dw glad because of the large crit multiplier on the 1h sword. You also have the benefit of crit resets on some skills. Off-topic question, what kind of dps do you pull on the lakrum scarecrows/training dummies? Either on 1h sword + shield or greatsword. So with 300 healing boost you get something like 27% more healing(the real % it's more or less 27,3) on 6.x. On Aion 5.8 the formula it's exactly "100 healing boost= 10% more healing effect"
Thanks for the contribution on Healing Boost, Etnas. But doesn't Bard also have a 10 % base healing multiplier? That would fudge your numbers and would mean that the bonus from Healing Boost is still 10 % per 100. As for the part about PvP attack/defence, I think you have misunderstood what's been said. 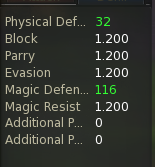 The new PvP attack/defence numbers are simply added to your Physical and Magical attack/defence numbers in the new damage formula. Before, PvP attack/defence was a percentage-based stat that was applied after the normal damage formula. Harboe wrote: Thanks for the contribution on Healing Boost, Etnas. But doesn't Bard also have a 10 % base healing multiplier? That would fudge your numbers and would mean that the bonus from Healing Boost is still 10 % per 100. I have rechecked better and yes you are right it's still 10% per 100 healing boost,sorry. For example the tooltip of "gentle echo" show 1668 hp. With 0 hb i heal 1834 hp(so 10%, thanks to the passive healing multiplier) while with 300 hb i heal 2335 hp(a total of 40%). Still missing base stats (HP and MP) for Chanter, Gunner and Ranger. Also, if anyone has a level 80 SM, it would be lovely if the summon stats could be provided. This is a screen from some time ago during the the gamecoast pts adventures. With that crit I had 28% critical chance, using Emp. Fury (+1000) it went up to 33%. Full end game gear is 51 manastones, you forgot you can socket them in every item you equip. so its 765 bonus attack with a full set. Unfortunately it sound good on paper but was not so good in practice, a friend tried full attack gladiator, yes really strong with that 5 second 100% crit berserking but once that was off it felt really weak. With crit there was much more pressure coming from him in our duels. A friend got over 7000 crit on bard with that NPC gear, so its possible to get close to that 40% rate. Every person that tried recommended crit even some KR players on their YouTube videos. Maybe a mix of both would be the perfect middle I don't know. I would probably use attack with a class that has high tooltip damage, templar has pretty trash tooltip damage and overall is one if not the worst class in solo pvp in 6.2. Guess we will have to wait and see how !A meta will be but for now everyone prefers crit. Regarding my damage on dummies, it was fine, I think sword is really close to greatsword even tho you can fuse it and get attack in the bonus stats, but sword makes up for that by having PvP attack on shield so its not that far off. feetsz wrote: This is a screen from some time ago during the the gamecoast pts adventures. With that crit I had 28% critical chance, using Emp. Fury (+1000) it went up to 33%. Yeah in theory the damage difference between gs and 1h sword will be VERY small if you arent getting little no auto attacks in. If you are running a crit build sword shield will have HIGHER dps without autos because of the larger crit multiplier. In pve weaving in autos between skills is important and end game gs have very very good auto dps so personally I would run a shield sword for the majority of my pvp and gs for the majority of my pve. What interested me was how very many kr streamers mained templar despite having fully geared secondaries and alts of other classes. Looked at powerbook for 6.5. They get huge buffs to breakpower and bloodpact. Bloodpact has a x3 multicast variant with stun on a 5s cooldown.. Breakpower gets a huge damage boost. Imo these are needed buffs and nice to see. Mind sharing your lakrum dummy/scarecrow dps numbers? Just curious what you roughly dpsed because Ive done a number of tests between different classes and players but only got 1 templar sample. Thanks! Do you also have the base MP number?